Add in the names of suppliers you use regularly and they will appear in the time-saving auto-complete list on the expense claim form. 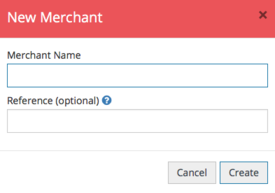 Once a merchant has been created it will appear when you fill in the merchant box of an expense claim. 1. From Admin, click Merchants. 2. Click the New Merchant button. 3. Add the merchant name. 4. The Reference field allows you to add a reference or code which you can use if you want to map these merchants to your accounting package. Once you're happy, click Create to add that merchant to your account.